Part of the Dolomite Super Ski Region is Plose Brixen in the Ski Valle Isarco region, the South Tyrol of Italy. With long wide slopes including the longest run in the Dolomites, 9 kilometers from the summit, Plose is well worth a ski day during your Dolomite ski vacation in the South Tyrol. Plose overlooks the Italian city of Brixen, near Gitschberg Jochtal – another ski area in the Val Isarco region, and an hour’s drive to the more famous Val Gardena which offers a larger ski resort connected to the Dolomites super ski region and the Sellaronda. Up the mountain from Brixen to a Gondola that starts in St Andria. From here you continue on up chairlifts to the upper peaks of Plose at 2,446-meters. Plose has some fun undulating trails from the top, and you can hike out to some incredible off piste terrain. Trails 2 through 11 (clever name, right?!) offer interesting pitches, red, blue and black – intermediate to difficult. Plose offers off-piste skiing on Gabler Peak with big snowfields that bring you back to the resort at the Skihutte on cross country traverses. We did not venture out, as snow pack and visibility were low, and we would want a guide for this backcountry terrain that looks tempting but tricky. From mid mountain, you can ski all the way down to the Skihutte chair or to Palmschoss or prepared pistes. Plose has a Fun Park – terrain park for free skier and riders on the upper mountain of Schonjochl. Plose has charming on mountain chalets, huts, for lunch and drinks at Rossalm, Bergrest, and St Stubele. 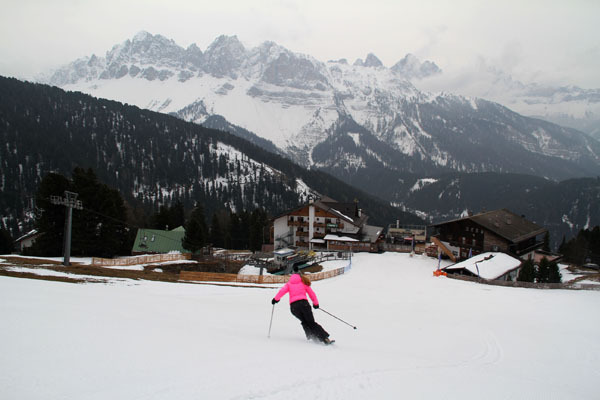 The “must ski” run at Plose is T9 – its the most popular – called Trametsch. This 9 kilometer beautifully long run winds all the way from the 2,446-meter summit to the base at Plose Stodl and St Andria. See if you can ski this trail # 2 to 1, the full 5.6 miles from top to bottom as a non-stop, and get your time in the Speed Check arena near the top. This is a really fun, really long descent, your thighs might be burning by the end where you catch a bridge back to the gondola, or your car if you save it for the last run of the day having parked at the Plose Kabinenbahn base. Plose also has the longest sledding run in the Dolomite region, RudiRun is a 10.5 kilometers on a sledge – weee! A day skiing Plose during an Italian ski trip to the Dolomites is worthwhile, near Val Gardena, Kronplatz, and Gitschberg Jochtal, and included in your Dolomite Superski Pass. While the scenery at Plose is different that the jagged Dolomite peaks you ski by in the Sellaronda, Val Gardena and Cortina, it is beautiful as you look out at the surrounding Alps and the beautiful valleys below.